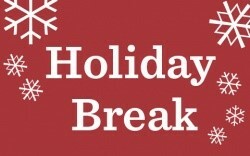 Preschool (Ira Allen, Flynn, IAA, and SA) will be closed for Holiday Break December 24th – January 2nd. Our Early Ed. office will be closed those days as well. Hope everyone has a wonderful holiday and a Happy New Year!